Although not published until 1985, five years after her death, Crampton Hodnet was one of Barbara Pym’s earliest completed novels, written in about 1939. During the war, when Barbara Pym was involved in war work like so many other people, the novel already finished, was laid aside. After the war she concentrated on novels like Some Tame Gazelle. I think it is because of it having been written during this period, that Crampton Hodnet felt so much like vintage Pym territory. It doesn’t have quite the perfection of some of her other novels, but there is so much that is recognisably familiar in the world of Crampton Hodnet (which confusingly not a real place – but more of an idea, a joke between Miss Morrow and Stephen Latimer) that it could only have been written by Barbara Pym. This was yet another re-read for me, but I hadn’t remembered it all that well. Crampton Hodnet is a marvellously comic period piece set in the genteel academic community of North Oxford in the 1930’s. Here we are reunited with Miss Jesse Morrow and Miss Dogget from (possibly my favourite Pym) Jane and Prudence. Companion to elderly Miss Doggett, Jessie Morrow content to think of herself as “unworldly” is briefly pursued by clergyman Stephen Latimer, who upon establishing himself in Miss Doggett’s house, thinks he really could “do worse than” Jesse Morrow. Meanwhile naive student Barbara Bird begins a highly idealistic entanglement with her tutor – Oxford don – Francis Cleveland a middle aged married man, whose daughter Anthea is having a slightly unsatisfactory romance of her own. Utterly charming, this is a sharp, bright novel; chock full of shuffling academics, clergymen, gossipy old spinsters, gay men and unsuitable attachments. Francis Cleveland, a middle-aged, dull academic is rather surprised to find himself the focus of an attractive young woman’s affections, although poor little Barbara Bird’s ideas of romance appear to be a mixture of eighteenth century poetry and platonic love. Francis is bored, often feeling excluded from the world his wife Margaret and daughter Anthea inhabits. Neither of these two unlikely romantics have any idea of how to conduct a romantic intrigue – the odd chaste kiss, a bottle of wine but no corkscrew, a hastily abandoned trip away together – they are each in their different ways innocents. Anthea Cleveland’s infatuation for the insufferable ambitious Simon Beddoes – is just as unsuitable as her father’s ridiculous attachment to one of his students, while handsome Stephen Latimer is rejected by the sensible Miss Morrow, and goes off to Paris with a friend. Miss Doggett who considers herself at the centre of this community watches all the goings on in North Oxford with concern. Much to Jesse Morrow’s dismay Miss Doggett insists on involving herself in the situation with Francis Cleveland (her nephew) and Barbara Bird – which has given rise to a lot of unfortunate gossip. Written with Barbara Pym’s wonderful wit and superb eye for the ridiculous, it is a joy of a read. There is something truly comforting about the world of Barbara Pym, which I can’t ever tire of. 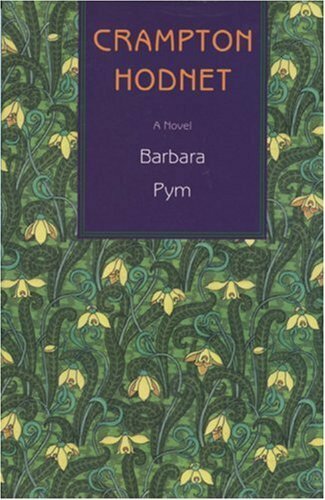 I am sure that there is quite a lot of the real Barbara Pym in the young bookish Barbara Bird, and maybe a little of her in the older sensible Jesse Morrow too – though one could never call Barbara Pym “unworldly” she was far too switched on for that. Never read a Barbara Pym and wouldn’t have thought I’d ever read one – but the passage excerpt and your quote are very very funny! So I will keep my eye open when I’m dong the rounds of second hand bookshops – I might read one yet! I’ve been looking for a comfort treat. Maybe I’ll give Pym a try. If you do, I hope you let me know what you think. I know I have some Pym on the bookshelf somewhere, but which I’m not sure. I expect I picked it up in Oxfam thinking I must read her someday and then never got round to it. Your review makes her sound like an early Barbara Trapido. I have never read Barbara Trapido so I have no idea. Barbara Pym is a fairly Sharp observer of a kind of English life that maybe doesn’t exist anymore but is instantly recognisable. One day I promise myself I will read one of her novels – this sounds like it could be a good starting point. The jacket design looks a little like a William Morris? I have five of these US Moyer Bell editions and I love them and keep my eyes firmly peeled for more of them. I think of all Pym’s novels, this is the one I enjoyed the least…not that I disliked it, but I didn’t find any of the characters particularly sympathetic. I first read “Excellent Women” a decade ago. I felt so “comforted” while reading it, and felt as though the writer Barbara Pym might be my soulmate or something. I really enjoyed it, and named it one of my four best books (altogether, in the world, not just fiction/novels). I just found Crampton Hodnet and I’m enjoying it very much.